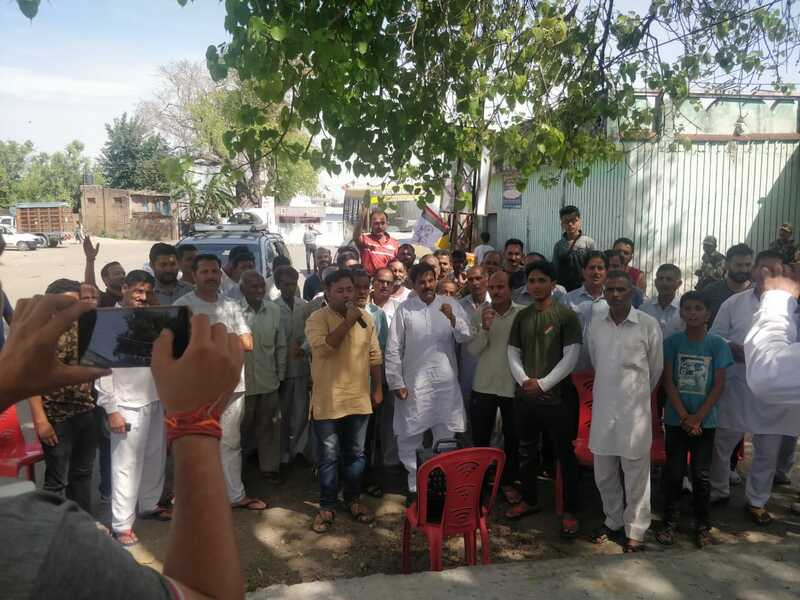 Kathua, Apr 14: Maintaining that NPP is the only party fighting for the cause of poor and marginalized sections of society, Mr. Harsh Dev Singh Chairman JKNPP and former Minister today appealed the people of Kathua to support their own regional party for the justice to deprived classes. He said that the present election was not a contest between political parties but it symbolized the fight between the poor and the rich-'the proletariats and the bourgeois'. With Panthers Party representing the cause of the oppressed, downtrodden and economically weaker sections, said Singh, the people had a golden opportunity to overthrow those who negated the concept of egalitarian society. He was addressing several public meetings in villages Float, Budhi, Pandrad, Barwal, Uttri, Logate, Garnadi of Kathua district in Udhampur Lok Sabha constituency today. Accusing the BJP, Congress and DSS candidates of using money and muscle power to influence the voters, Mr. Harsh Dev said that several crores of rupees were being spent by them in their election campaign with none to take cognizance. The said parties were brazenly spending their ill gotten wealth without any regard for election laws in the shape of publicity materials, posters, banners, freebies, choppers and thousands of vehicles deployed by them to lure the voters. They are the parties who had nothing to offer to the people while in power except enriching their own coffers, said Singh. While appealing the people to wisely distinguish between the genuine representatives and pseudo champions of the public. He said that Panthers alone had been representing the cause of deprived class in true spirit and taking on the mighty and powerful for ensuring them justice. While in power or out of power, the Panthers Party sincerely fought for justice to working class, DRWs, casuals, need based workers, contractuals , ReTs, general category employees, farmers, border dwellers, etc, said Singh. "We lodged several protests in the streets of Jammu, Kashmir and New Delhi against the Central and State governments for settling the bonafide demands of marginalized sections and for undoing the injustice perpetrated against them by successive governments. It never appeared to other contesting candidates and parties to come to the succour of agitating daily wagers and contractual of PHE, PWD, Electric maintenance, forests, NHM, MGNREGA, Anganwadi and ASHA workers who were frequently lathi- charged and humiliated during their respective regimes. It's the Panthers Party alone which truly represents the poor sections of society as against its counterparts who always promoted the interests of the rich and influential, the mighty and powerful", Harsh maintained.